When creative minds collaborate, the sky is the limit! 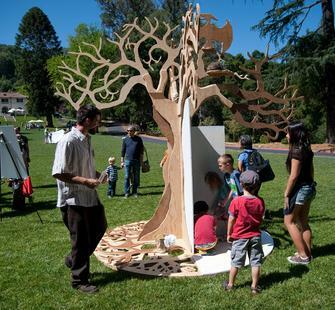 After studying trees on nature walks through Montalvo’s grounds, young artists will work together to conceptualize and build a 12-foot sculpture of a tree–designing and decorating the roots, trunk, branches, and leaves! In the development of the sculpture, students will learn how to capture the energy of a subject by making gesture drawings and participate in interactive plays where they act out the forces of the sun, wind, and rain. Along the way, they will learn important lessons about biology, woodworking, visual art, engineering, and the power of teamwork.